Jukola or as I like to call it, Run for your life! 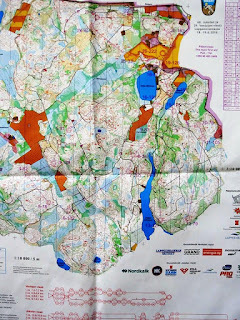 Three weekends ago I participated in the biggest orienteering relay ever for me! 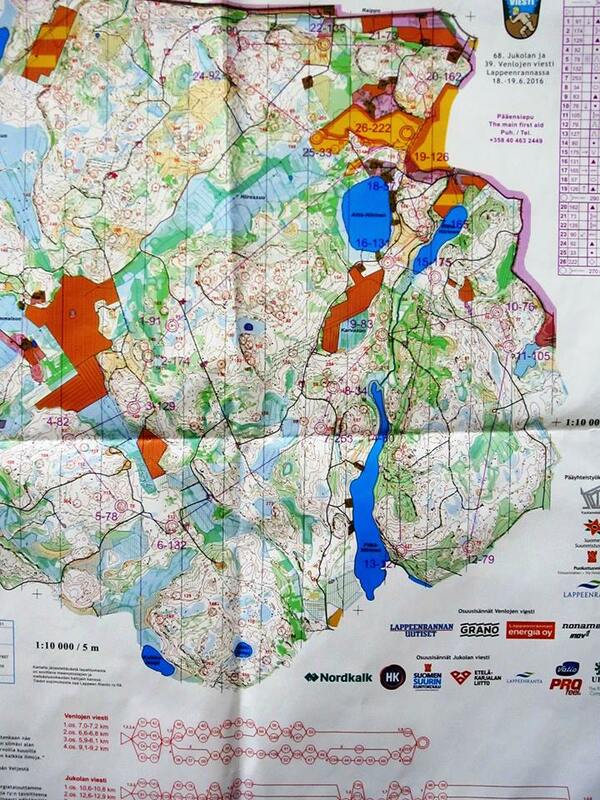 Jukola is a 7 man night relay but it’s not dark for the whole race just 3 legs. The race starts at 11pm right after the sun sets with a mass start. This year their was 1707 team racing, that’s a lot of people. Pia Blake wanted to run our first leg so she was crammed in with all those guys and a few girls, she was 4 spots over from Emily Kemp who was running Ottawa’s first leg as well. The start signal for the relay this year was someone from the Finnish army firing of what sounded like a machine gun to me and then a 4-wheeler takes off with a camera man on the back to film the stamped of racers. Their was also a Drone flying over top so you can see them running to the start control. The mass starts runners had a longer flagged route to the start then the other legs because trying to fit that many runners under a bridge right away would have been pandemonium. The Jukola mass start, can you see Pia? 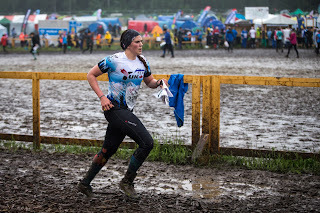 I forgot to mention how it was raining pretty much the whole time so Jukola town (what I like to call it) became a gigantic mud bath. I was so happy I bought a pair of rain boots otherwise I wouldn’t have been a happy camper. Outside of Jukola town was where a lot of other teams slept, some also slept in the stadium. Team Yukon and Ottawa were outside and in the same area. The Finnish army set up a lot of their tents for teams to use. It was an experience because I have never slept in an army tent before. It was also easier to communicate with the team stay in a gigantic tent instead of separate little tents. Pia and Leif at the gateway to Jukola Town! I was running leg 4 for the team, a nice easy princess leg. I don’t remember if I started running at 3:30 or 4:30 in the morning, that’s a hint on how well my first control went. The timing was pretty perfect for the hand off, I was ready 15 minutes ahead and could warm up and not get to drenched. Forest passed me the map and it was the size of those annoying fold road maps. I had a marked route of 600m to the start control which a massive sign with an orienteering flag on it. As I mentioned before my first leg was not great, it sucked! I got overwhelmed and felt like I had to go fast. I had 20 guys chasing me down right at the start and I didn’t have a great route choice. I got on one of the elephant tracks and checked my barring to make sure it was going in the right direction but I didn’t check it often enough. I was also running a lot faster then I usually do to the first control so I under ran the first control. I kept try to make sense of where I was but nothing was fitting. After trying to relocate for a long time (I am to embarrassed to say how long) I asked someone where are we and they pointed it and the map made total sense after that. I have defiantly learned from my mistake! Thanks to Ken Walker for the great Photo! The rest of my race was great after that, I either spiked controls or was just a feature over. I could push hard the whole race and not feel like I was dying. The terrain there was gorgeous! I am use to lots of hills, negative topography and messy vegetation. It has so clean, not to hilly just lots of mud and elephant tracks. On facebook there have been post comparing the terrain to war trenches and I can vouche for that. If you could clear a creek or trench you fell into hip deep mud and had to drag yourself out. Jukola was a great experience and a lot of fun. I would defiantly love to race in Jukola again and next time I won’t be as intimidated by all the runners. Welcome to the blog of Orienteering Canada's High Performance Program and National Teams. Follow along in our racing and training throughout Canada and the world! SOW you think you can orienteer!